The Flora Womens’ Mini Marathon will get underway at 3pm while runners in Cork have already completed 26 miles of the city’s marathon. NEARLY FIFTY THOUSAND woman will run, jog, walk, roll or maybe even crawl over the 10km course of the Flora Women’s Mini Marathon this afternoon. 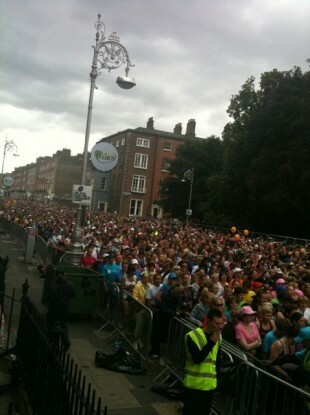 The Mini Marathon has been run in Dublin since 1983 and is the world’s biggest female-only race. The Irish Independent reports that €10 million will have been raised for charity by this evening, and that €137 million has been collected in the history of the marathon. The race got underway from Fitzwilliam Square at 3pm this afternoon, and The Irish Times reports that by the time some of the runners have reached the finish line at St. Stephen’s Green, some of the women will just be heading off from the starting line. Some Dublin Bus services are also affected so check with their website before you head out. Meanwhile the Cork City Marathon got underway at 9am this morning, with 26 miles stretching out in front of the runners there. The Irish Independent tells the story of 18 friends who are running their first marathon in Cork today to raise funds for a friend who has been diagnosed with motor neurone disease. €3 million will have been raised by the time the last runner crosses the line. Traffic diversions are also in place in Cork will some closures lasting until 5pm. The event started on Patrick Street and that will remain closed until 5pm. Some areas have alread reopened as the marathon got underway at 9am, but bear in mind that closures will continue throughout the afternoon. Email “And they're off! Mini-marathon fever hits Dublin ”. Feedback on “And they're off! Mini-marathon fever hits Dublin ”.